Beautifully restored two bedroom 18th century self-catering cottage close to the beach where guests can use the facilities of the adjacent Porth Veor Manor Hotel. If you love original character features but also modern comforts then Pilgrim Cottage will appeal. Beautifully restored, the cottage dates back to the early 18th Century and comes complete with beamed ceilings, a cosy wood burner and cob walls. Contemporary fixings and furnishings now feature throughout the cottage, melding old and new seamlessly. Two bedrooms, one double and one twin, make the cottage suitable for four people. The cottage has plenty of room with a lounge area, well equipped kitchen with a breakfast bar and adjoining dining area plus a sun lounge leading to a private garden with a decking area. The cottage sits adjacent to Porth Veor Manor Hotel and all guests have access to the hotel facilities including Beaucliffes Restaurant, the bar and outdoor heated pool (open April to October). Porth beach is just 100 metres away. Well equipped kitchen with an electric oven, hob, integral microwave, integrated fridge and separate freezer, wine fridge, dishwasher. A comprehensive range of utensils, crockery and cutlery are included. Private parking space (1 car) directly outside the cottage. If two parking spaces are required, one can be parked free of charge in the lower car park at Porth Veor Manor. Lowest prices are bookable online but please see below for a guide to the maximum price our online system will charge. 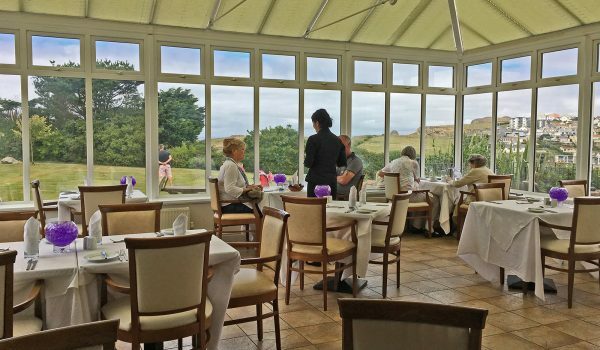 At Beaucliffes restaurant, a full Cornish breakfast is available for just £7.95 per person or £6 if taken for the full holiday duration (non-residents £10.95). Children under 14 years, 50%. All Pilgrim Cottage guests qualify for our special dining discount at Beaucliffes, where you can save 20%. Families with children are most welcome and early dinner commences between 5:30 – 6:45pm.